So, with a fresh water pump, off we went. 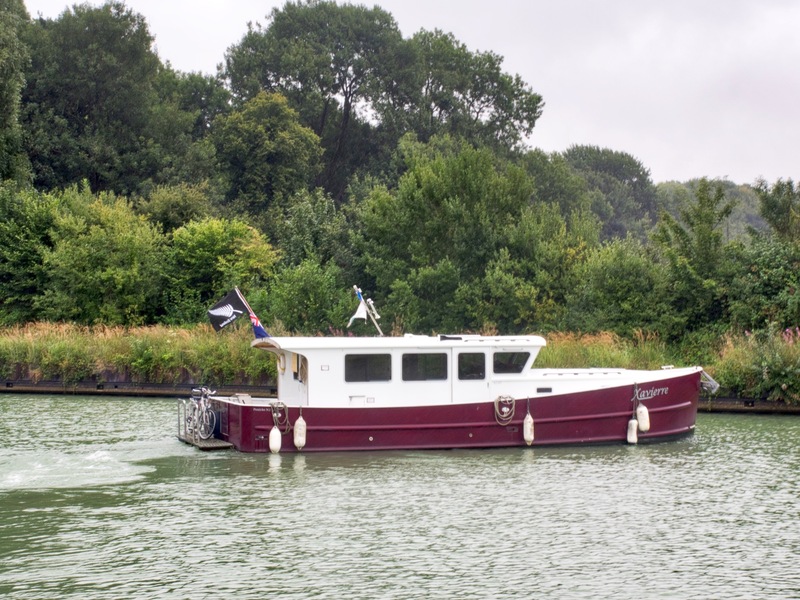 Our aim was to get to the River Somme as fast as possible so we could really begin to enjoy recreational cruising. We were on the highly commercial Canal du Nord but we now find such canals quite relaxing. Early on we picked up a Dutch-flagged cruiser and let them lead the way into the locks and this made it even easier. 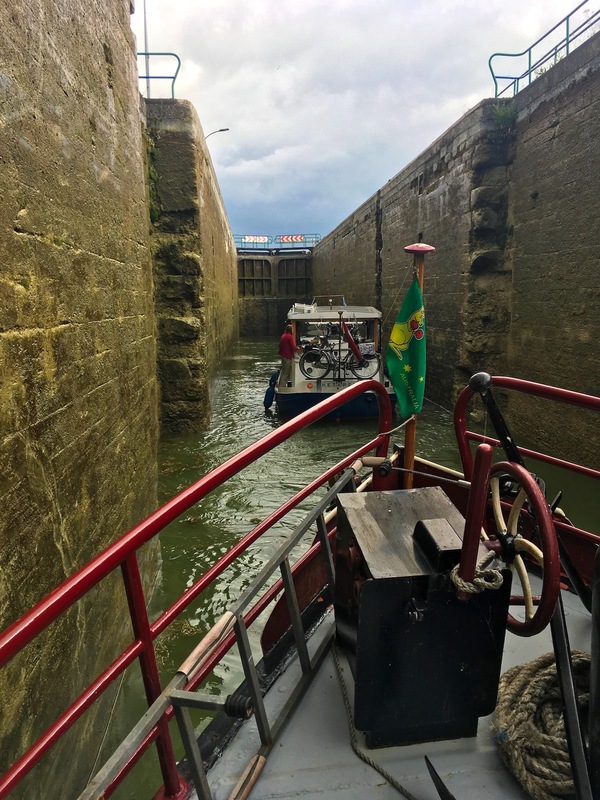 We negotiated some seven locks, all about six to eight metres rise without incident other than some concerns with some dubious safety procedures on the Dutch vessel. The locks were all about 6 m change in depth. Anyhow, the challenge for the day appeared in the late afternoon. As we had risen to the highest point of this canal, the next section, was downwards towards the Somme. 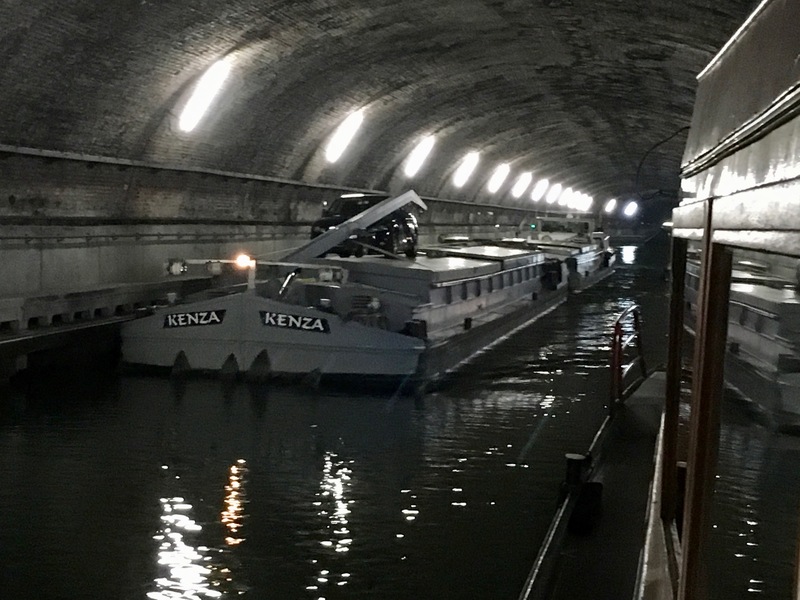 As is usual, rather than using locks to cover the last rise, the canal passes through a tunnel. The Dutch cruiser enters the tunnel before us. The unusual aspect was, of course, we had never done a tunnel before. We were pretty well informed about this tunnel. The Grand Souterrain de Ruyaulcourt is 4.3 km long, very well lit and has rubber bumpers on the side. It is a little over six metres wide over most of its length. 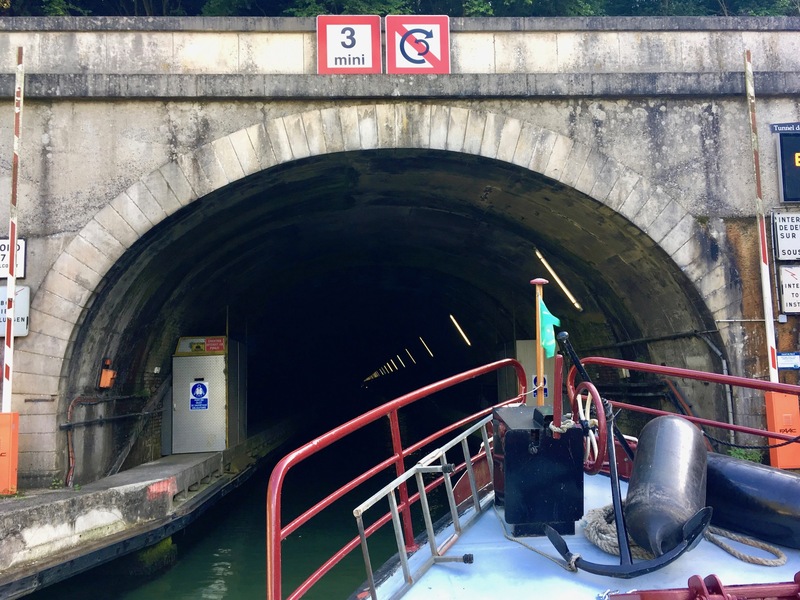 Probably the most comfortable tunnel in France! The trick is that in the middle, it expands to just over 12 m wide for a stretch so that barges can pass in either direction. One side is halted (there are stop lights) and is required to moor up, while the other vessels pass by. Entry is closely controlled at each end by a control tower somewhere aided by all-seeing cameras everywhere. So, we approached the tunnel following the Dutch cruiser and shortly after we entered the tunnel an 85 m commercial came up behind us. At the entry point, we noted a 3 km per hour limit in illuminated numbers and tried to restrict our speed as much as possible. It didn’t seem to bother the Dutch vessel, which sped ahead. It turned out, as we learned several weeks later, that the 3 km/h limit was a lower limit. They actually expected you to go a little faster than that. We crawled to the middle passing section and, with red lights against us, moored up a little way behind the cruiser with the patient commercial behind us. As there was only one convenient bollard, we put on a bow line and set the rudder and engine to spring against this for when the vessels travelling in the opposite directions passed us. Approaching the middle section where it widens. The first of these appeared soon after and we actually recognised it as one of the barges that had been recently in the dry dock being painted. It was now running as a double, so two 39 m peniches bow to stern. More importantly, they were both full so they were displacing the best part of 700 tonnes in a narrow waterway. 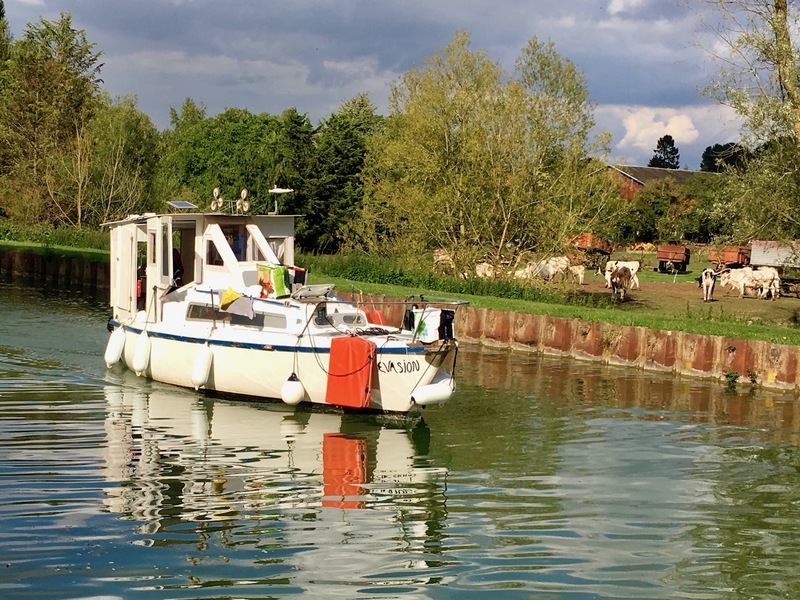 Fully laden double peniche – with ‘Kenza’ in front – who we remembered from the first part of our stay in Despinoy’s. Well, as this first one passed, despite the spring on the bow rope and the engine, Catharina Elisabeth’s stern was drawn further and further out with the pull from the passing commercial, until, while the second of half of the two barges passed, our stern started to drag along the hull of that vessel. To say the barge skipper was not happy is, of course, a massive understatement. He gave it to us full on by voice and gesture. He gradually moved on but we knew there were more barges coming through on their way north. So before they showed up we dashed to the side and managed to locate some concrete piles on which the towpath was mounted and were just able to throw a stern rope under and around them before the next barge arrived. Now we had two ropes, the next (again, double peniche) cruised by uneventfully. Once everyone had passed, and although we were some-what shaken, we retrieved our ropes and crept cautiously forward once we got a green light. There was a woman out on the bow of the large commercial barge behind us and she called out several times to ask if we were OK. We thought this was about the collision but, on reflection, it was probably because we were going too slow. She remained on the bow in radio contact with her husband in the wheelhouse, until we exited the tunnel a while later. 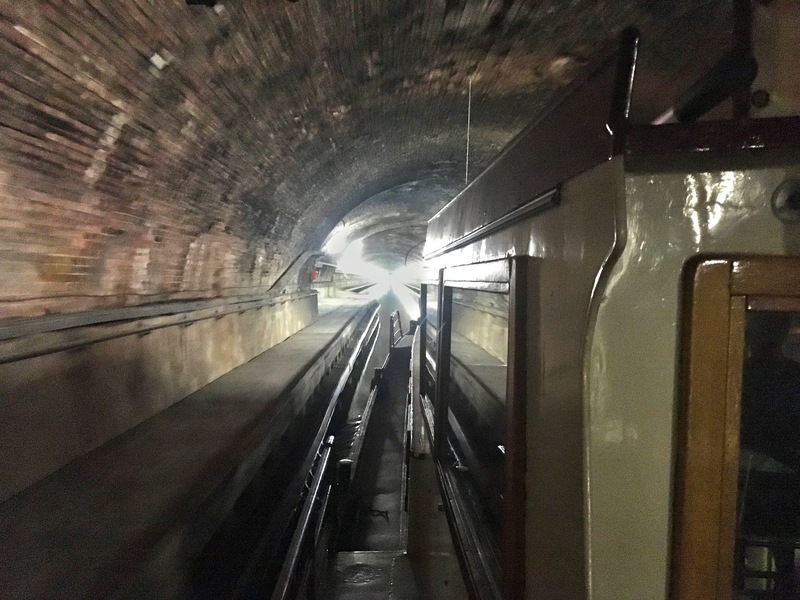 He would not have been able to see us way down low in front of him, and without a way to use a radio while travelling through the tunnel, he would have no way of knowing exactly where we were. Soon we were out of the tunnel and moved to one side so the commercial could pass us and get on its way. We were now on tenterhooks. What if the bridge control was angry with us too? What would they do? What would the skipper on Kenza do? 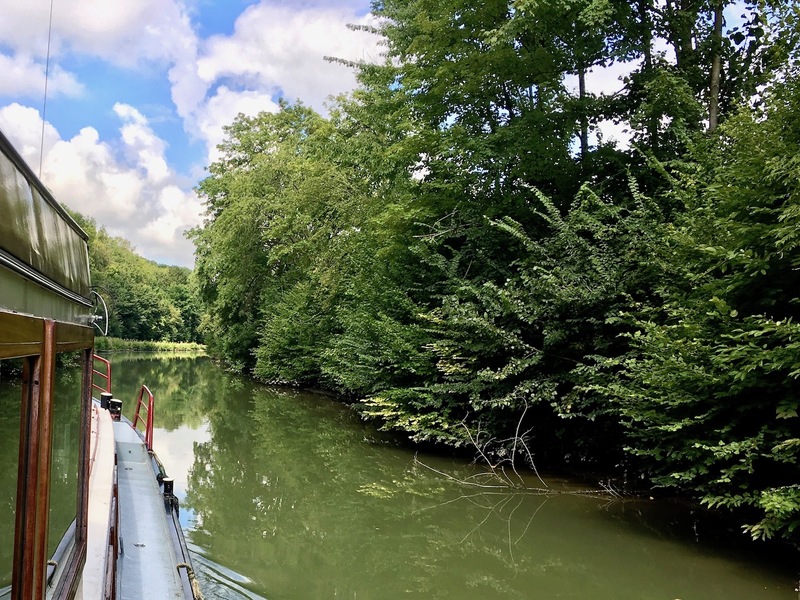 Many commercials use this canal to travel backwards and forwards over and over again as it is a very straightforward north-south route to Paris. What would happen if we met Kenza again? 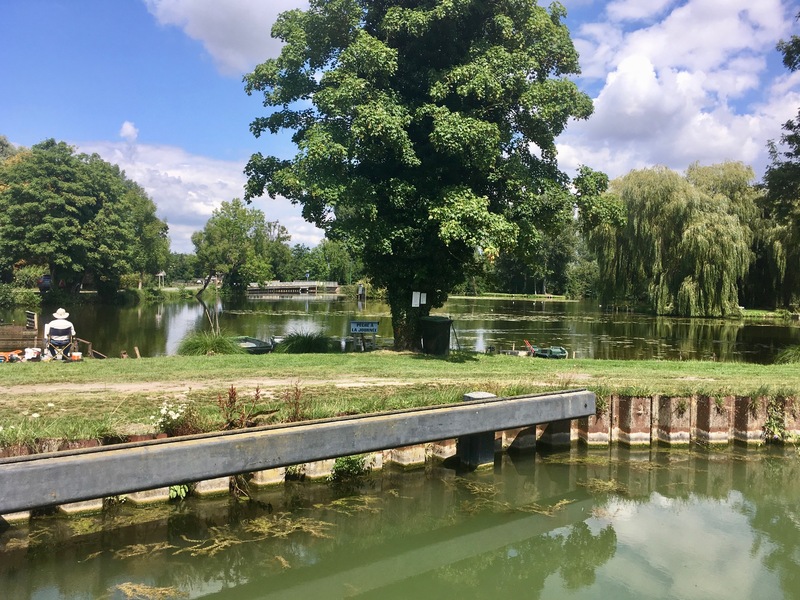 All this meant that, given we had been cruising for ten hours, we took the first mooring we came to (Bois de Vaux, just south of Manancourt) so we could relax, have a stiff Belgian beer and de-stress. The mooring was perfect, not only after the tunnel events but also after four weeks in a busy port. It was wide, empty and wild. Just what the doctor ordered. So much so that we decided that even without facilities or civilisation, we would at least spend two nights here. The overnight weather was pretty stormy but it cleared up the next morning. Early on, a recreational barge headed past going towards the tunnel. Seeing us, they hove to and cruised over to have a chat – very social of them. It was a Kiwi boat, Xavierre, custom built in New Zealand and shipped out to Europe. The family had been cruising on her during the summer for many years. After an exchange of pleasantries and information about local conditions, they pushed away and headed for the tunnel. Note the white fenders that protect her hull. We spent the day relaxing mostly. We took a cycle ride into the nearest town – very little at all there. The only notable event was that Ian forgot to take his battery and while it wasn’t too hilly, there were several sections where Lisette cruised past a huffing and puffing Ian on some of the more aggressive gradients. 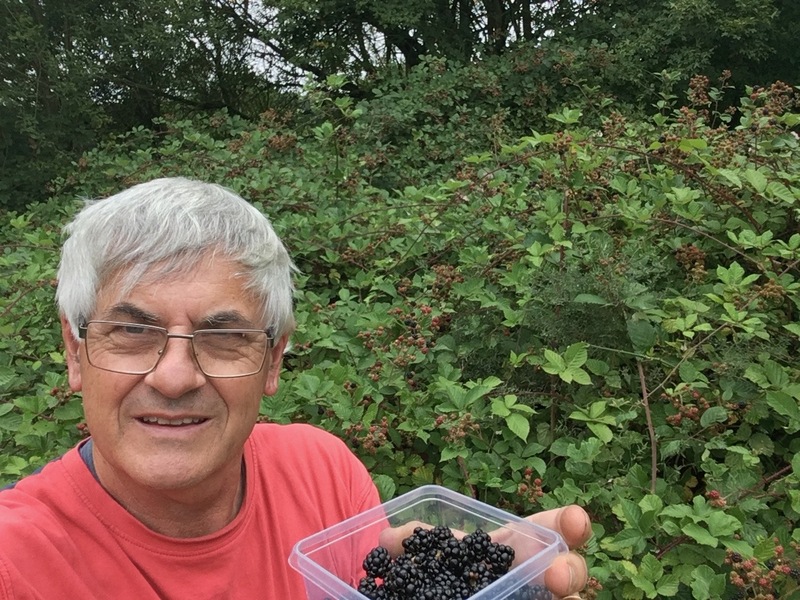 We ended off the day picking heaps of ripe blackberries for dessert. Of course, to get the best ones, you have to hack through to the inside of the thicket. So many, we had to store some of them. Note to all – blackberries don’t store well. After a couple of days, while they still look great, they become quite bitter. You learn these things from travelling! A lovely surface mist to start the day. 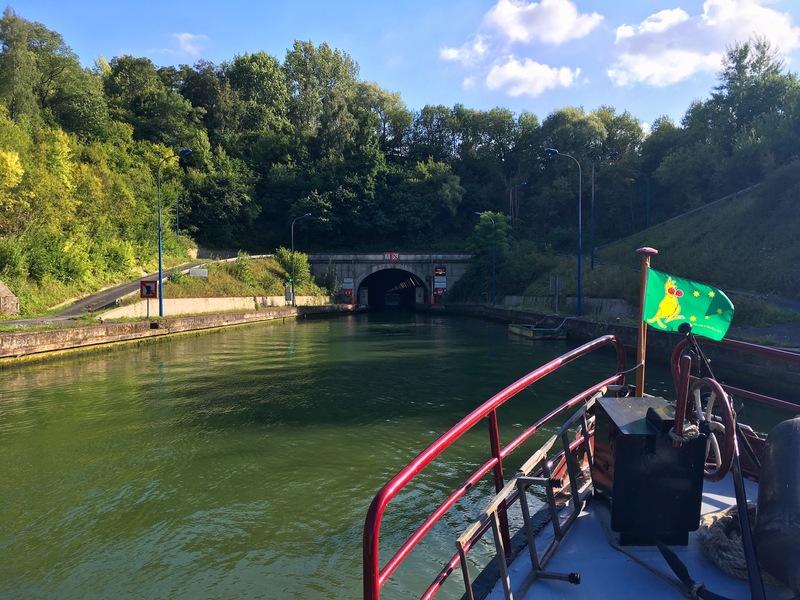 After our rest day, we set off for the last locks before the entrance to the Somme. We approached with some trepidation. Was this where officialdom was going to vent their wrath at our accident? Our mood was not helped one little bit when we had to moor up waiting for the lock and a man on a scooter sped towards us. The man on the scooter came right from the lock office in front. Whatever it was, it took a fair bit of conversation but it didn’t look too confrontational. The chap on the scooter was interested in selling Lisette some tomatoes – he was on a winner there, as we were expecting a four-figure fine so a few euros for tomatoes was an excellent deal! He was also concerned about our balloon fenders. 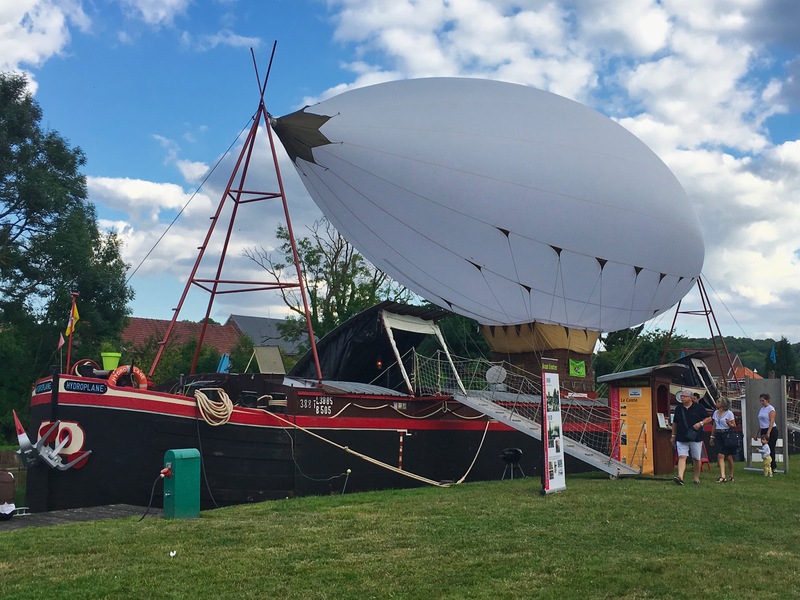 It took a while to tease out the issue but, eventually, it transpired that the day before he had seen a boat lose one of its small balloon fenders in the lock. He seemed to say he had dived in (?) – he did keep saying plonger (to dive) – to retrieve it and now wondered if we wanted it. Gift horse and all that so we said yes. He sped off on the scooter and, tout de suite, was back with tomatoes avec fender. The fender looks suspiciously like the ones on the Kiwi cruiser! Well-pleased, we moved into the lock when it was our turn and, without any comment from the lock keeper, were lowered the six or so metres that we had become used to on this canal. 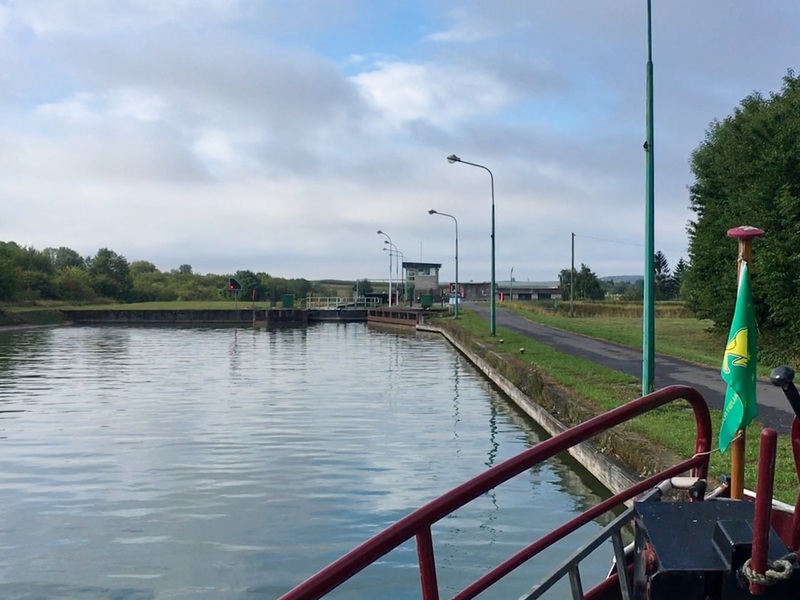 What goes up must come down, and with the peak of the rise of the Canal du Nord being the tunnel, we worked our way through another half dozen similar locks until we arrived at the intersection where we cautiously turned into the river Somme. Finally! Just after entering the Somme. Immediately we were in another world. 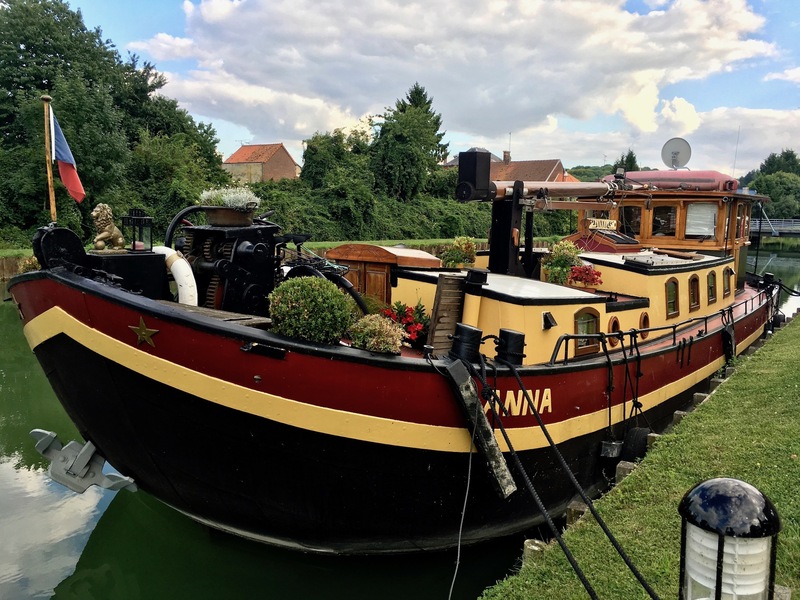 The waterway narrowed, the depth was quite shallow and Catharina began to require constant attention and encouragement to keep her heading and speed. The trees and waterside closed in and the sun came out. It really did! 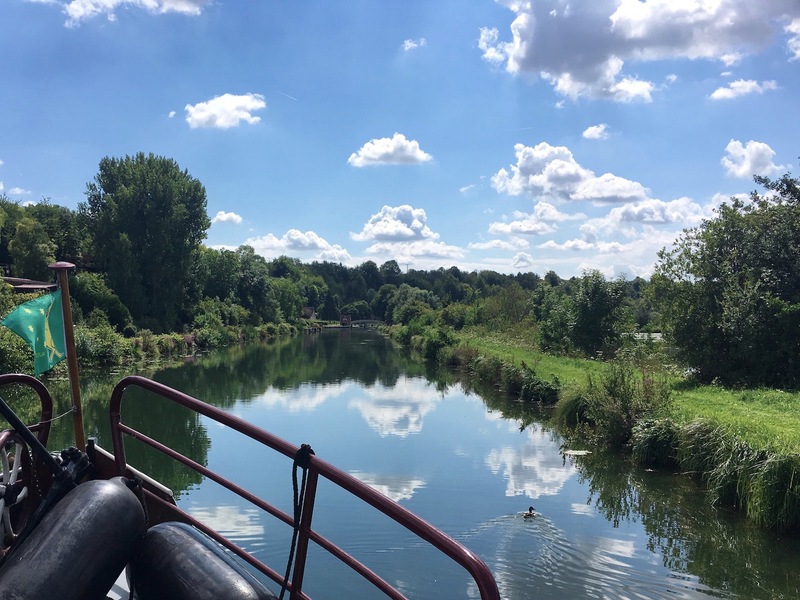 We were in some sort of heaven as we cruised down to the first lock. This was closed for lunch, so we waited in a pleasant little mooring just soaking up the atmosphere. 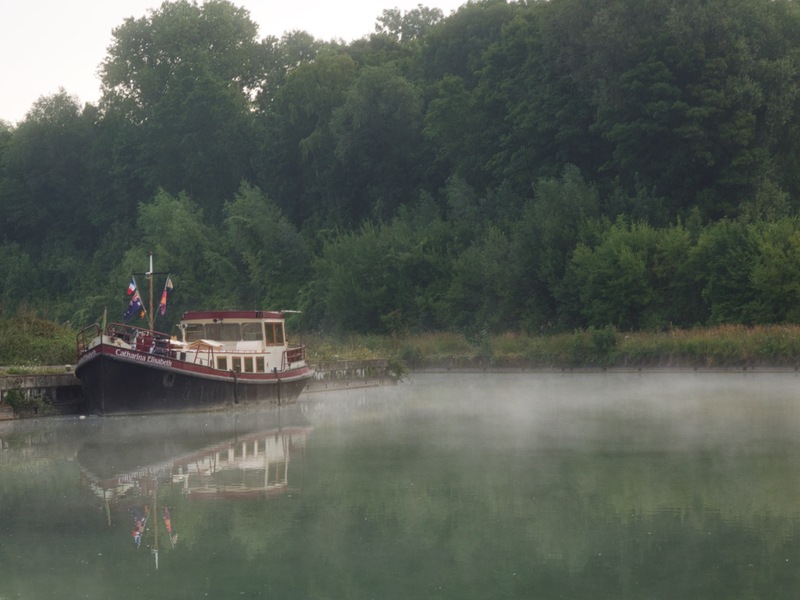 After lunch, the éclusier arrived to let us into the first lock and take our details. 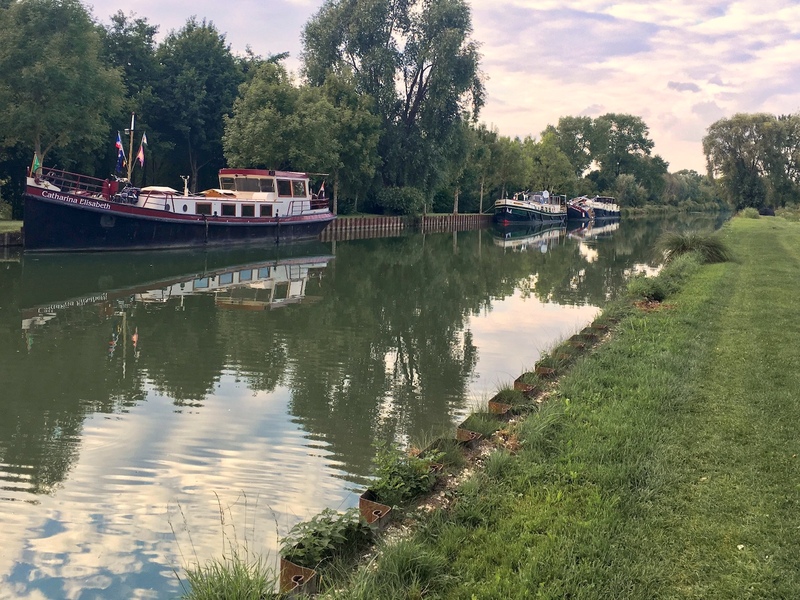 Most of France’s waterways are under the control of the VNF (Voies navigables de France) but the Somme is under the control of a regional organisation – basically funded by all the towns on the river, and based at Amiens. By all accounts, it was a very well run system, manned and womanded by sociable and ever helpful staff. Our experience was, overwhelmingly, that this was absolutely the case. 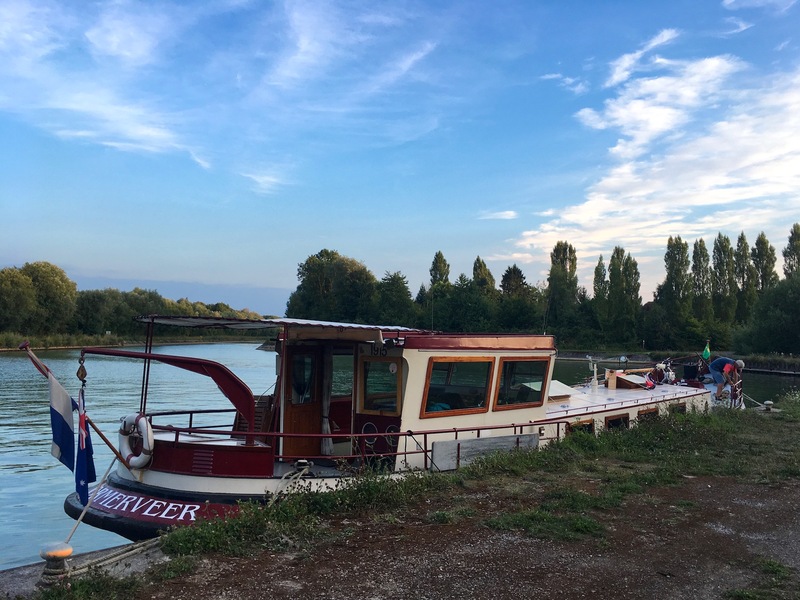 We were provided with excellent documentation on the waterway (locks, travel times, phone numbers, opening hours, facilities etc) and we, well Lisette, had a very cheery conversation with the first éclusier. He was careful however to take Catharina’s name and length, beam, air draft and water draft measurements. It turned out that the water draft was the really important number, as it governed some lock usage later on. But we’ll get to that. So, we headed off down a simply gorgeous, sunny riverway. Small buildings, towpaths, sloping hills and large areas of ponds off to the side. This is a feature of the Somme. In days past, the shores of the river were mined for peat. So much was taken that there are wide areas of lakes where the water has filled the peat diggings and all along the Somme, these pools stretch out on one side, or the other, or both. Great for fish and wildlife and therefore very popular for local tourists and recreation. Pretty location for a quiet mooring (we actually did spend a night against that pontoon on our way back a few weeks later). 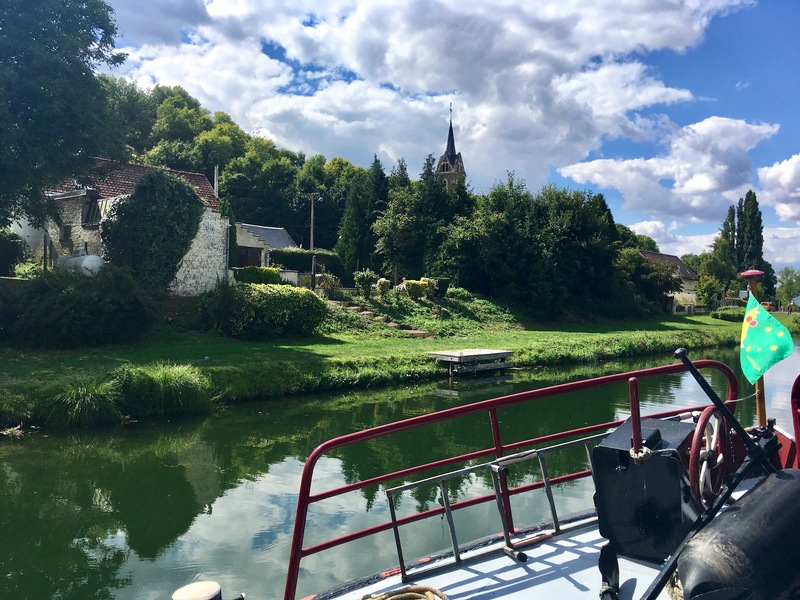 We cruised on, enjoying it all, taking note of the occasional mooring for possible use on the return leg and soon we were in the small village of Cappy, where we moored up in the early afternoon. You don’t have to have a barge to have a wheelhouse. Notice the cow paddock, just across from our mooring. Cappy used to be the site of a hire boat business, which, sadly for the town and the river, closed a couple of years ago. However, the moorings are still excellent and on a bright sunny Sunday, everyone was out along the riverside relaxing and fishing. Noting a couple of big barges we moved a little further downstream and made apologies to a fisherman, who courteously moved aside so we could moor up. Not long after, another biggish barge arrived so there were four barges stretched along the bank. 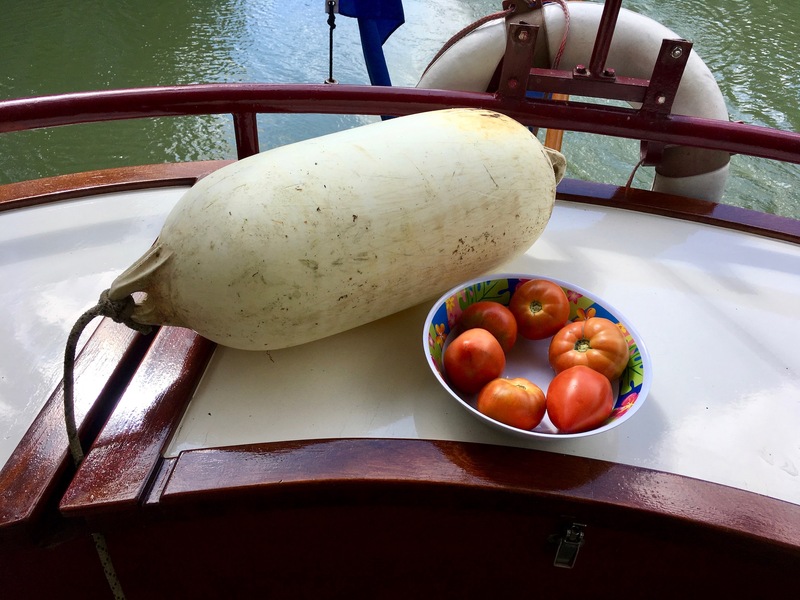 No, we’re not snobs – some other boats left after we arrived! We knew two of them from our time in Belgium last year (Vrouwe Rosiena II and Panache), and the other (Passe Lagom) was owned by good friends (Torild and Nils, who we had met at the Briare rally last year) of our friends Rebecca and Michel. All four of the barges were also DBA members. So we chatted with everyone and worked out who was going where. Two were headed back out of the Somme, but the last to arrive, Passe Lagom, was headed in our direction so we expected that we would see them again. We took a walk along the lovely grassy banks, towards the village, past a beautifully fitted out old barge and then to a striking peniche. Absolutely spotless and gorgeous barge. Towering over the deck was a balloon. 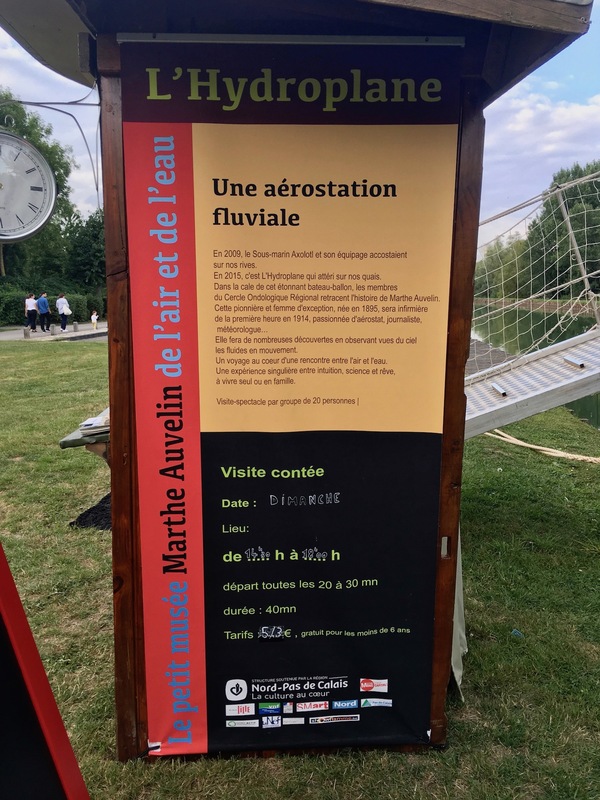 It transpired that Hydroplane was a floating museum that cruised around the waterways offering tours and a touch of French history. The subject it covered was of a pioneer woman aviator early in the 20th century. Marthe Auvelin. Born in 1895 in Maubeuge and as a youngster became infatuated with fixed lighter than air balloons (aerostats) when visiting the World Fair in Paris in 1902 with her father. In 1910 she made her first balloon flight with her father who was making aerial photos of the Seine. During the war, she first served as a nurse on a hospital barge on the Somme. Ever innovative, she would use hypnosis to alleviate the pain of the wounded soldiers. Seeing how rough road transport was on the patients, she managed to convince the Army to allow her to evacuate the wounded by balloon and continued this until 1919. Marthe had a rich and diverse career after the War. She travelled Europe widely as a journalist but became best known for pioneering the use of aerostats for the measurement of meteorological conditions and improving weather forecasting. Marthe was an early leader in the use of the science of fluid dynamics to explain the behaviour of the atmosphere as it related to weather. After the WWII she continued her work in meteorology and aerial photography and died in 1983. A fascinating woman. Sadly, we had arrived after the last tour, and early next morning, the museum cruised off up the Somme away from us, so we never managed to make it inside. Hopefully, we will come across it in the future – if you do, stop by and tell us what you find. We walked on into the village of Cappy, which looked a bit sad. A number of the business had closed – doubtless due to the loss of the hire boat trade. So we sauntered back to Catharina for dinner and a sleep amongst the fruity smells of the cattle yard directly across from us. Memories of the Netherlands! 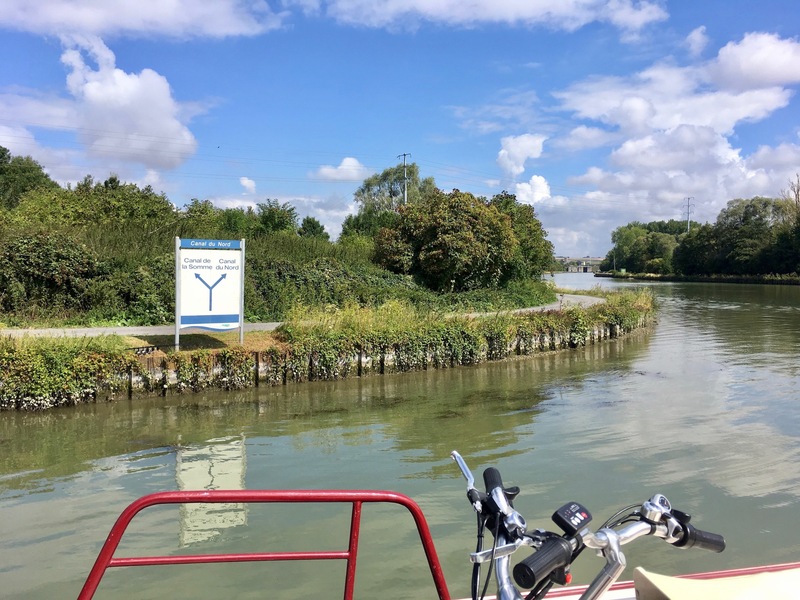 Our immediate plan was to be in Amiens in two days time to meet our highly anticipated and delayed first set of guests, but we had one significant stop to make before that. We bought tomatoes from that guy, too. They were delicious! And we also missed the baloon boat. They were just setting up in Amien when we left on the way back to the C du N.
Back to Oldtimer April 18 and headed east the end of the month. Just what we need on a cold February evening in Groningen, pictures of barges and sunshine. Still, the days are getting longer and the sun warmer and soon it will be spring. We’ll be in France doing some work with Willem in May; maybe we can find you on the way past. It would be so good to catch up again, but we don’t return until July 3 this year and I expect you will be back in the Netherlands by that time. We definitely plan to see Willem again as we will be cruising in France for a while now as we have spent our first season there. Hopefully there will be a time when you and Claudia are there too. Another super post! I am enjoying these as we did the Canal du Nord the opposite way round. I felt so much for you with your tunnel incident. How awful! Especially as the barge had just been painted! No wonder you were shaken! With my hopeless ‘what if’ tendency, I’d also wondered about what would happen when we were moored up there and luckily, we did what you did: tied to the pilings, or the same thing would have happened to us, I’m sure. Those bollards are far too far apart. I wonder that they don’t do something about that to help the smaller barges. Anyway, all was well in the end, and you got a fender and some tomatoes instead of a fine. Perfect! Cappy was a bit sad, wasn’t it? I shall now look forward to your next post. It’s lovely to re-live the adventure through your blog! I wasn’t particularly bothered about taking the tunnel before we did it. It was just going to be another new experience. But the incident was quite unpleasant. Yet we were happy enough to return that way a few weeks later. At least we now knew what to expect. I imagine the bollards are placed to suit commercials, not 20 metre pleasure barges. We took a long walk around Cappy but there was so little to see. It’s sad to realise how these little villages are slowly losing their identity. I often wonder how the locals feel as they witness the changes that seem to be inevitable. Another good read – thank you. The Somme is on our radar for 2019 and we will probably end up in Diksmuide for the winter.